The Somolu area of Lagos last Friday, October 26, was put under siege as a group of robbers numbering about 20, attacked the area robbing residents of valuables. Reports say armed men with sophisticated weapons robbed around Fola Agoro Street in the Somolu area stealing two vehicles: a black Murano jeep with registration EC 480 GGE and a red Nissan Quest with registration number XM 03 SA. The robbers were said to have been moving from street to street and door to door carrying out their robbery activities without any fear despite the presence of a police station in the area. 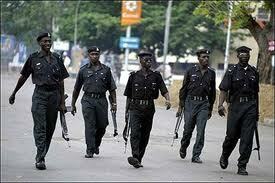 Witnesses say they robbed on Balogun Street which also has Alade police station. They moved to Anifowose Street, just behind the police station before moving to Awoseyin Street to continue to robbery siege. Some residents of 41, Anifowose street tried to repel the robbers but failed owing to the superior firepower of the robbers. One resident known as Olomi was said to have sustained injuries in the exchange of fire. Occupants of 32, Awoseyin street didn’t fare any better as every room in the highly populated building was robbed. An occupant of the building said, “I heard a loud noise in the middle of the night and came out to ask what the problem was because I actually thought the people were policemen. Instead, I came face to face with the robbers. At 4, Awoseyin Street, the robbers startled a couple who had just welcomed a new baby to their home. Despite pleas from Akinkunmi Afolabi that his wife had just put to bed, the robbers insisted that the nursing mother lie on the floor with her children while they went ahead to beat the husband at gunpoint. The 72-year-old landlady of the house was very lucky. The robbers met her saying her morning prayers and on account of that, she was spared when she said she had no money to give. At that time, it was almost 4:20am. Throughout the duration of the robbery, reports say no help came from the Alade police station until the robbery siege was lifted. Residents complain that there has been a sharp increase in robberies in the Somolu area. The Lagos State police public relations officer, DSP Ngozi Braide, was not available to give her comments on the robbery. God will have mercy on d masses in Nigeria. Afterall, d Nigerian constitutions are so weak.